In creating energy-efficient buildings, one of the most important goals is to accurately predict during the design stage how a structure will perform when occupied—not only the natural resources used to produce it, but also the ongoing energy consumed for its regular operation. New opportunities combining modern carpentry techniques and the Passive House standard help achieve these goals. There are three main ways to make a building energy-efficient—using less energy, generating more energy with renewable resources, or taking a combined approach of the two. In this author’s opinion, doing both is the best option. However, it is first important to eliminate heat losses due to design strategies and construction techniques. In winter, heat in buildings is often needlessly lost due to conditioned air escaping through cracks in the envelope. To replace this heat, heaters are used. 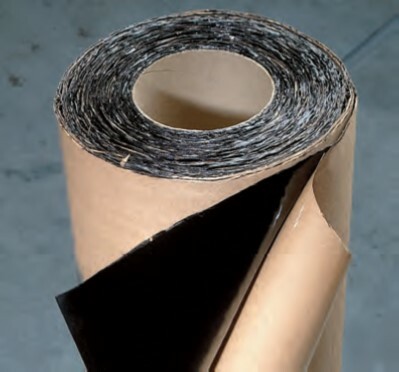 Eliminating air leakage and heat loss in buildings by making them airtight is the most important factor for making buildings energy-efficient. It is not enough to design buildings using energy efficiency strategies—they must also be constructed accordingly and then meet the energy consumption goals of the design during operation. This is similar to a car manufacturer designing and producing a vehicle with a specific fuel economy, and then having the car actually meet that target. Everyone is familiar with comparing cars in terms of ‘miles per gallon,’ and now a similar unit of measurement for buildings is needed. At some point, this metric for energy consumption of a building or apartment might even be included in the Multiple Listing Service (MLS). The European Union (EU) requires every building have an Energy Performance Certificate listing the energy consumption of space heating and cooling, water heating, lighting, and appliances. The certificate must be available to buyers and tenants when a building is constructed, sold, or leased. 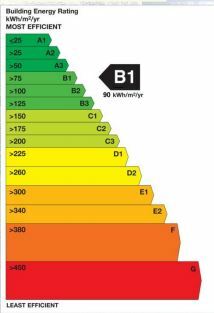 In Europe, the unit of measurement used for the certificate is kWh/m2/year. In the United States, energy consumption in buildings is compared to the local energy code requirements in relative numbers as opposed to a consumption rate. Buildings are described as being a certain percentage better than the prevailing code, rather than having their actual consumption cited. As new energy code updates take effect, a similar unit of measurement comparable to the Energy Performance Certificate will be established. In the meantime, the Passive House standard is a good tool to measure and compare how much energy buildings are consuming. Passive House calculates energy consumption (in kWh/sf/year), and includes energy-use from space heating, cooling, and ventilation systems, along with water heating, lighting, and appliances. Under the standard, the maximum energy allowed for heating and cooling is 1.4 kWh/sf/year. The standard has become successful because it has proven it can accurately predict, during the design stages, the building’s eventual energy consumption. (This is comparable to a car company claiming a car will get 30 mpg and proving to be correct.) Predicting the energy consumption in the design stages is done with the Passive House Planning Package—an energy modeling tool. The Passive House standard is a whole building strategy that harmonizes all aspects of a structure beginning with data on local weather and solar orientation and continuing with the design, layout, foundation, framing, and insulation systems to reduce, or even eliminate, thermal bridging. It also optimizes specification of the openings (i.e. doors, windows, and curtain walls), heating, cooling, and ventilation systems, along with lighting and appliances. 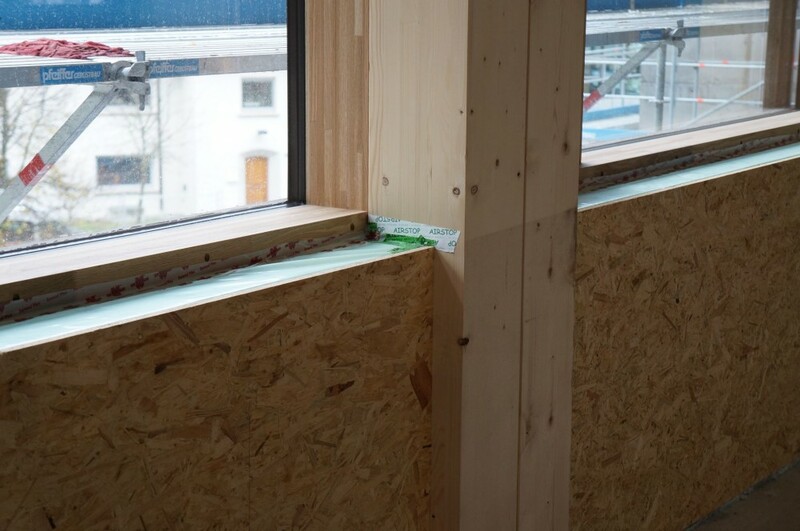 Most importantly, Passive House has a specific requirement for airtightness, which is where the biggest connection to modern wood carpentry is made. Airtightness is measured with a blower door test.3 Air is either pumped into or sucked out of a building to see how much air is leaked, in both pressurized and depressurized states. This is similar to fixing a leak in a bicycle inner tube. Air is pumped into the tube and placed in water and the leaks are found by following the bubbles. For buildings, smoke or other instruments are used to find leaks during a blower door test. If the test is performed before the building envelope is covered up, the leaks can be sealed to make the building airtight. Lighting and all appliances (including ovens, cooktops, refrigerators, toasters, and computers), generate some heat. Instead of allowing this heat to escape through a leaky building envelope, it is trapped inside a tight building envelope. A mechanical ventilator, with a heat recovery component, brings in fresh air into the living spaces and removes the same amount of stale air from kitchens and bathrooms. The heat in the outgoing stale air is transferred to the incoming fresh air inside the ventilator. This recycling (or ‘U-turn’) of ‘free’ heat’ that comes out of everyday appliances and lighting can dramatically reduce a building’s energy consumption. Future energy codes in North America will also be targeting a net-zero energy standard. A net-zero energy building is hooked up to the grid and draws electricity and natural gas from the grid. The building also has a source for generating renewable energy such as solar or wind energy. During a one-year period, the amount of energy a building draws from the grid has to equal the energy it generates from renewable resources. The easiest way to meet the net-zero energy standard is to consume less energy, which is where the strategy of Passive House, in combination with modern carpentry, becomes valuable. To combine this strategy with the choice of materials and construction methods, use of modern engineered wood products—stable, cut accurately with computerized equipment, and assembled under a controlled environment—results in airtight buildings that are automatically energy-efficient. 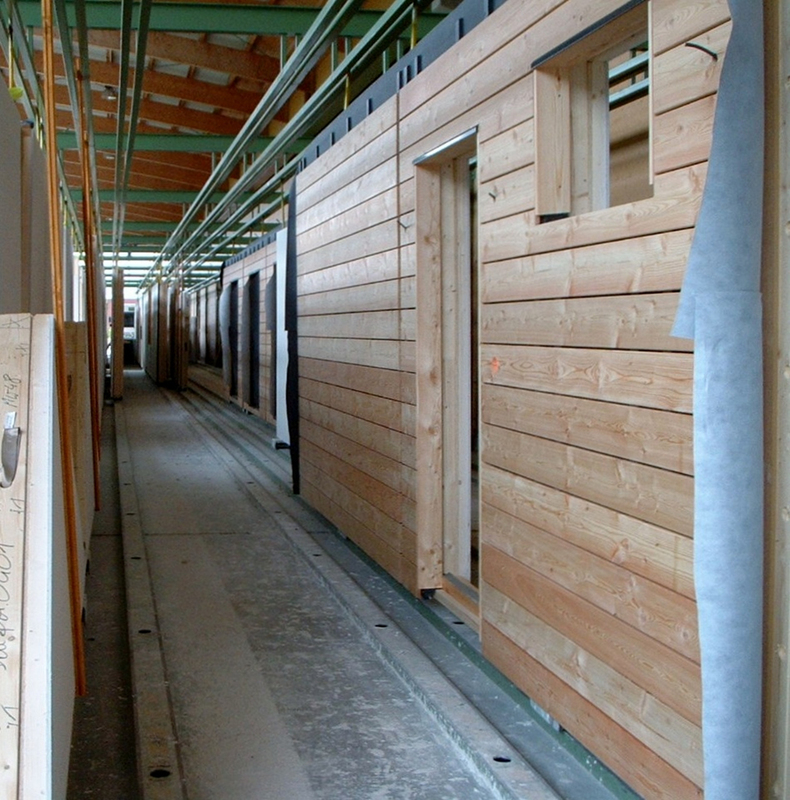 Prefabrication and modular wood construction is helping building designers achieve this while increasing the speed of construction and reducing project cost. Energy-efficient design is also becoming more important in North America, as the U.S. Department of Environment (DOE) has a goal of all new commercial buildings being ‘net zero’ by 2025. The post-and-beam method of wood construction was prevalent in many cities at the beginning of the last century, before the industrial revolution introduced concrete and steel. Now, wood products are beginning to increase again in popularity due to awareness over some of the negative environmental effect of products extracted and manufactured with intensive use of fossil fuels. Of course, this is not to say one product type is always better than another—each material has special properties and they should be combined to make hybrid buildings. Modern timber products for structural framing are referred to as engineered lumber. These members use smaller pieces of wood, eliminating the need to harvest large trees. The ends of these smaller pieces are finger-jointed and glued to make longer pieces. 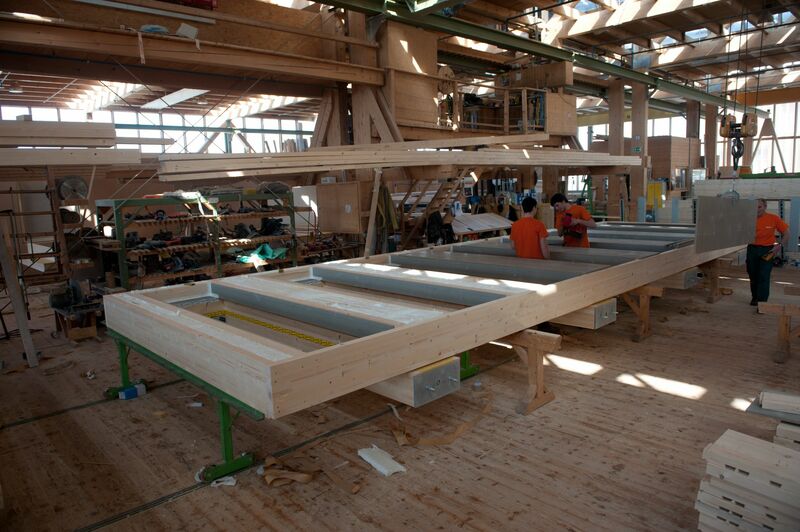 Several long pieces are laminated together to make large glued-laminated (glulam) post and beams. 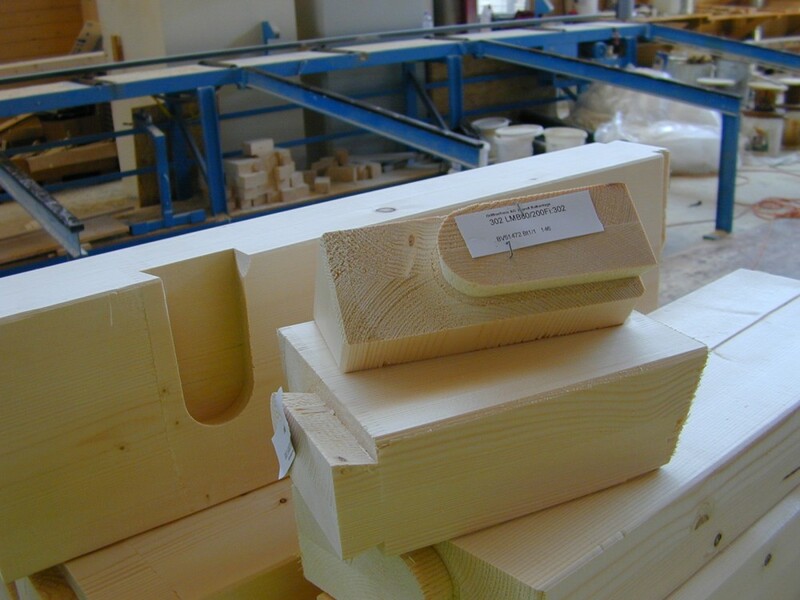 This lumber is stable and will not shrink or twist because it is dry, which is a great advantage for airtightness, performing much better than traditional stick frame wood with higher moisture content. The modern process of carpentry is based on digital, computerized information. The carpentry company receives the computer-aided design (CAD) drawings from the architect. They transfer the drawings to 3D-CAD/computer-aided manufacturing (CAM) program where the wood frame can be looked at in 3D and the structure can be optimized. This is called optimal value-engineered, or ‘smart,’ framing. Every piece of wood is placed in an exact location and has a purpose. Unnecessary framing members are eliminated and replaced with insulation to optimize energy performance. The material is then fed to a wood-cutting machine that uses the computer numerical control (CNC) data to precisely cut all the elements. The engineered lumber is stable and is cut precisely and eliminates waste since the members can be 12.1 to 18.2 m (40 to 60 ft) long. 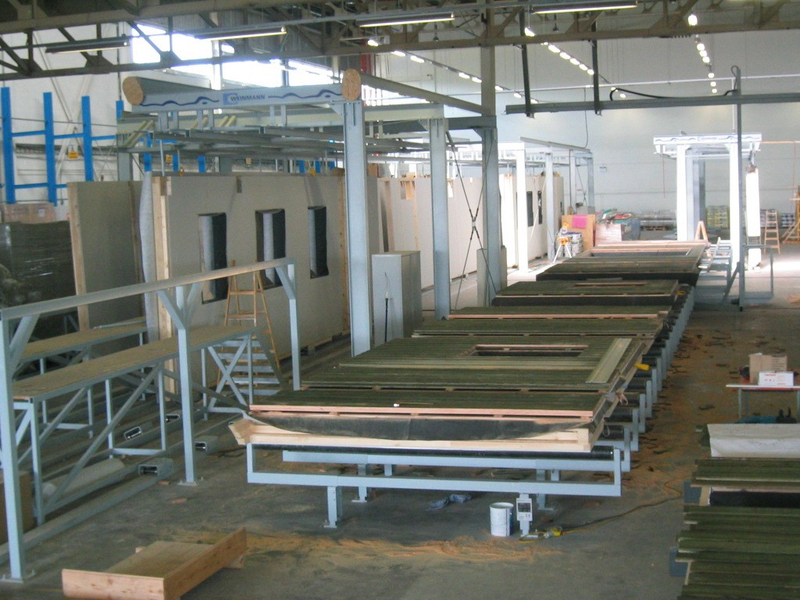 The individual pieces are assembled together in a facility, working on tables and prefabricated into wall, floor, and roof elements. 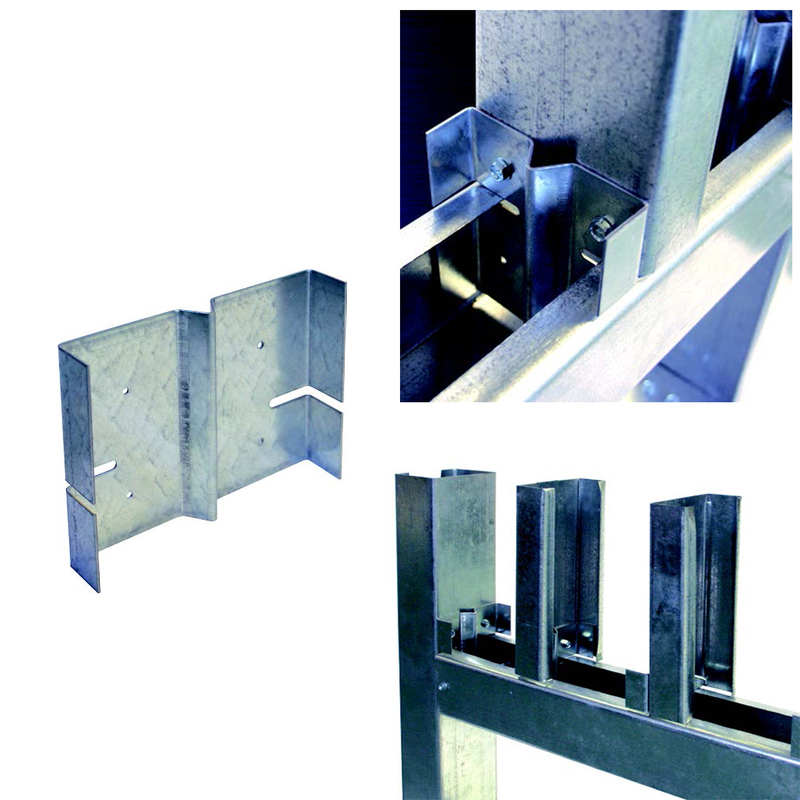 These components can be quickly erected onsite in an airtight manner, ensuring energy-efficient construction. Instead of asking carpenters to measure, cut, and assemble walls and floors onsite, employing labor-intensive processes, the carpenters are moved in a controlled environment, where they are given the drawings and pieces for each component to be assembled, making use of overhead cranes and forklifts to protect their bodies. This wall element was craned in place. 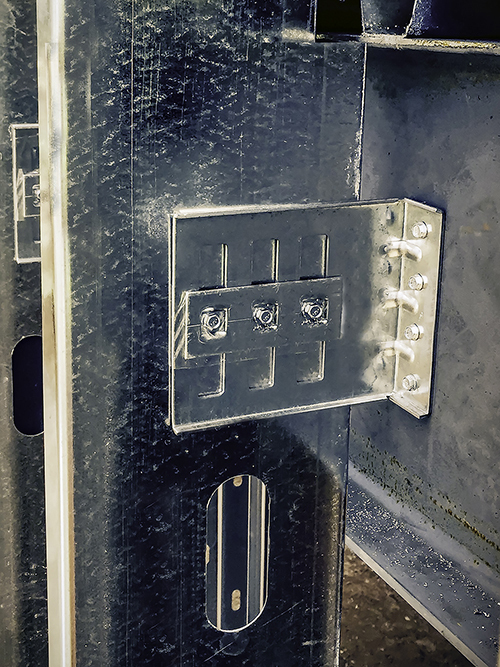 These types of components can be completed onsite in an airtight manner. assembling them quickly onsite to be cost-competitive, while automatically meeting airtightness requirements. 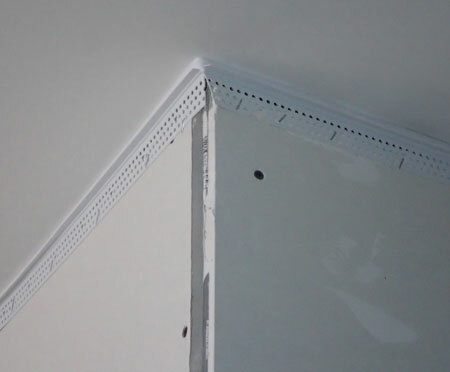 Using this construction process and modern carpentry skills, the building envelope’s thermal performance and airtightness can be predicted during the design stages. To prove the performance, the envelope is tested for airtightness with a blower door test after assembly. Similarly, the energy performance of a building can be predicted using the Passive House standard during the design stages—through the thousands of certified buildings in Europe, the actual energy consumption during occupancy has been shown to match the predicted values. Overall, the use of new modern wood technologies can have a positive effect on construction industry from job creation to reduced environmental impact. 1 There have been dozens of certified projects in North America, and the numbers are growing fast. There are two competing U.S. organizations, and both of them have databases and listings for these projects. The North American Passive House Network (NAPHN)—www.naphnetwork.org—is directly affiliated with the Passive House Institute (PHI) in Germany, while the Passive House Institute US (PHIUS)—phius.org—was founded by someone who used to work with PHI, before branching off. 2 For more information, see Naturally Wood’s “Green Building with Wood–Module 3” at www.naturallywood.com/sites/default/files/Module-3-Energy-Conservation.pdf. 4 The limitations of these types of wood assemblies are the current building codes or special approval by a jurisdiction for alternative means of design and construction. 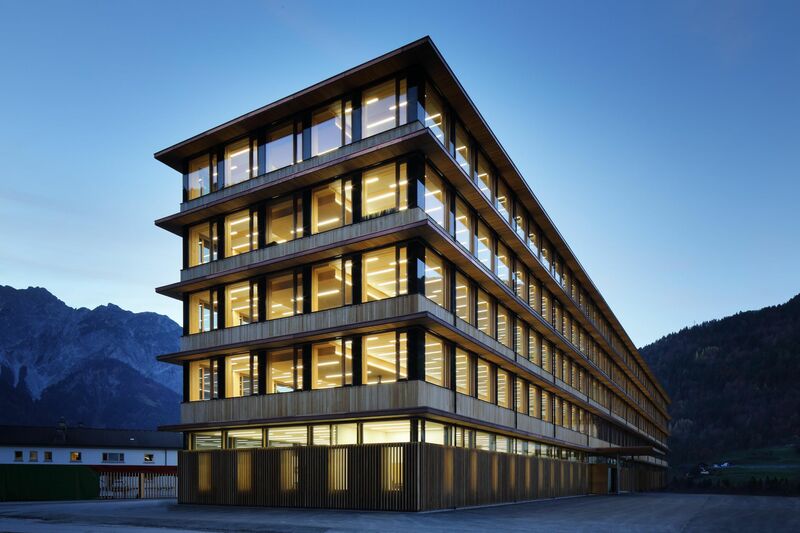 Obviously, it is not a one-for-one switch between wood and concrete—the architect and engineers have to run calculations for both materials to ensure the design meets the structural, seismic, acoustic, and thermal requirements. At the moment, the building codes limit wood buildings to 75 ft (i.e. 23 m). 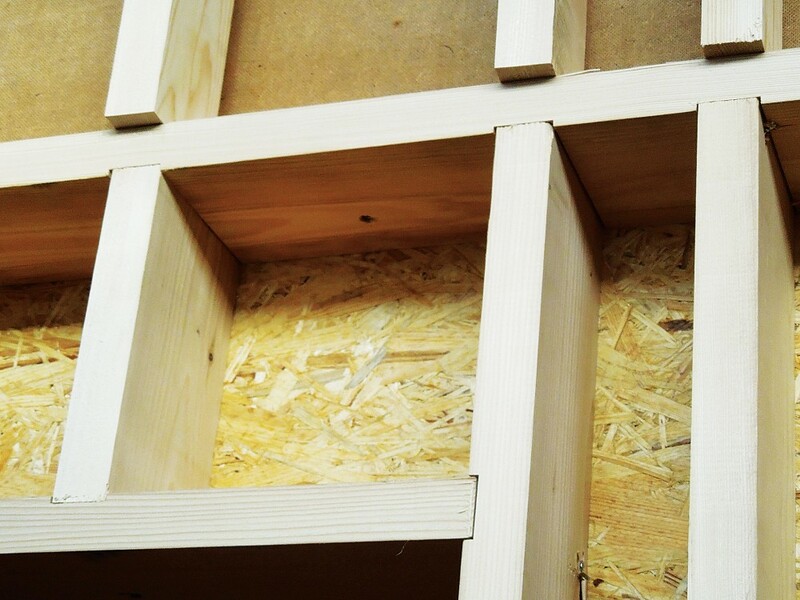 The wood industry is in the process of testing new wood products such as CLT for fire and seismic performance. This author’s company is in the process of negotiating a partnership/joint venture agreement to participate in an Expression of Interest for a 16 to 18-story student residence building utilizing advanced wood-based building system, physically demonstrating the applicability of wood in the tall building market. 5 For more on wood and fire resistance, see “Design of Fire-resistive Exposed Wood Members,” by Bradford Douglas, PE, and Jason Smart, PE, which appeared in the July 2014 issue of The Construction Specifier. 6 Visit www.passiv.de/en/02_informations/02_passive-house-requirements/02_passive-house-requirements.htm for more information. 7 This is a consultant that collaborates with the architect, and structural, mechanical, and electrical engineers. During the design stages, the passive house consultant begins the energy modeling in the Passive House Planning Package (PHPP) tool to determine the heating, cooling, and electrical loads. The PH consultant then submits the calculation to either PHI or PHIUS for pre-certification. 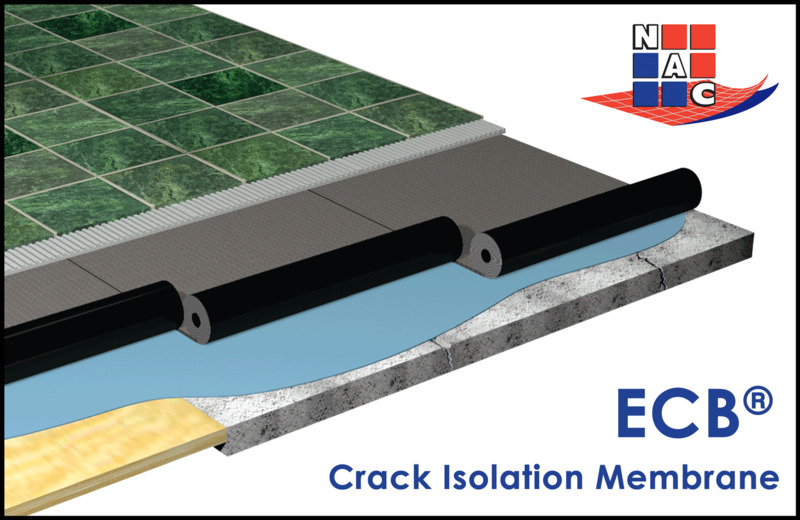 The MEP engineers use these calculations to design the system, and the architect and structural engineers design the details to eliminate or reduce thermal bridging. 8 For more, see this author’s previous article, “LCT ONE–A Case Study of an Eight-story Wood Office Building,” in the March 2014 issue of The Construction Specifier. Nabih Tahan, AIA, is an international architect, Passive House consultant, and CEO of Cree Buildings Inc. For more than 30 years, he has honed his knowledge in architecture, energy efficiency, and sustainable timber-based construction methods through work in Austria, Ireland, and the United States. Currently, Tahan is guiding Cree Buildings to establish a systems approach to design and construction, combining wood and energy efficiency strategies to build single-family and multi-family residential projects, along with office buildings. He can be contacted at nabih.tahan@creebuildings.com. I am so glad that I was able to find this! I am about to start building my new home, and I really wanted to make sure I built the foundation correctly. So I really appreciate you talking about this, and talking about the benefits of using a wooden frame. I’ll definitely have to look into this! Thanks for the help.